There’s a new front in the stealth marketing war on American consumers: urban murals sponsored by big corporations. While you were sleeping, or maybe it was just us, Retna and El Mac threw up another masterpiece in Westlake. The mural has been complete for over a week now, but LA Weekly was there as the first sketches went down at MacArthur Park Primary Center, courtesy of Procter and Gamble. 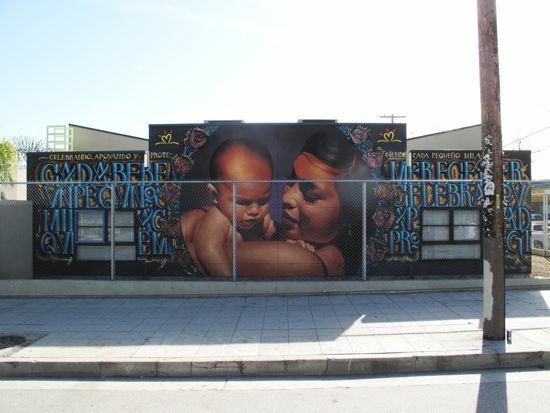 This legal art wall, on the side of a mid-city arts magnet kindergarten and preschool, is not ostensibly branded but was commissioned by Pampers’ using their community tag line, “Every baby is a little miracle to be celebrated, supported and protected,” in two of Retna’s signature fonts. Surrounding the centerpiece mother and child by El Mac, are 10 roses, with names representing real children, chosen by P+G through public story submissions. Stealth advertising at its graffiti best. Or worst. Depending on how you look at it.